Guy Frisch (percussion), André Pons-Valdès (violin), and Anik Schwall (cello). Custom-made wallpaper made from a high resolution scan of a print of a small section of an etching by Gustav Doré' from his interpretation of the sky of Hell for Dante's Inferno, forms the backdrop to a turntable playing a lathe cut record. 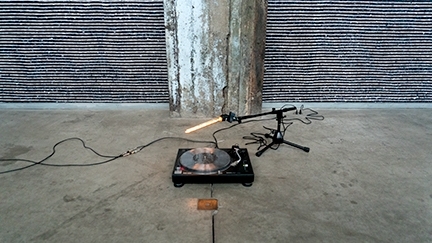 The music on the record is never heard by the audience but instead seen as flickering light on a nearby monitor. The music ends in a lock groove, spinning continuously. The audience is welcome to restart the record at any time. 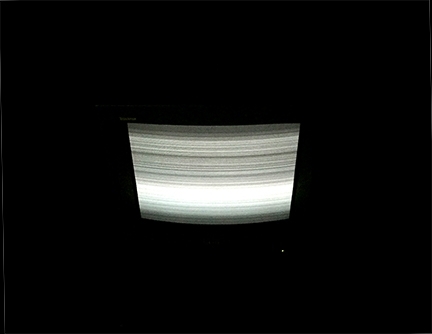 When the stylus is lifted from the record, the monitor goes black, and relights as the stylus is set down again. 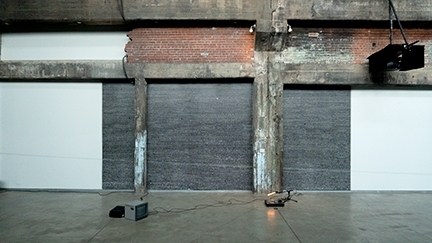 The Performance Before, After, During (2018) refers to the installation Run out and Infinity presented in the exhibition. It refers to the missing sound. 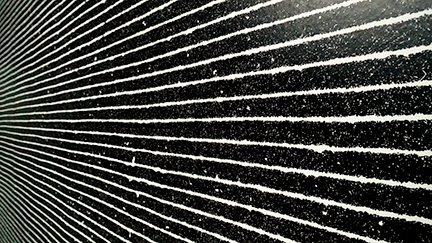 Steve Bates uses the perceptible sounds before and after a piece of music on a record. Three musicians of the Luxembourg ensemble United Instruments of Lucilin play the actual song, dust and claws on the record as part of the composition. Thank you: Caroline Andrieux, Ji-Yoon Han, Milly-Alexandra Dery, Alfonso Esparza and all of the staff and interns at Fonderie Darling, Kevin Muehlen, Stilbé Schroeder, Patrick Scholtes, Christine Walentiny, and all of the staff at Casino Luxembourg, Florence Martin, Guy Frisch, André Pons-Valdés, Anik Schwall at United Instruments of Lucilin, and Zac Decamp at Chestnut Street Records.